Dragonlance is a shared universe created by Laura and Tracy Hickman, and expanded by Tracy Hickman and Margaret Weis under the direction of TSR, Inc. into a series of fantasy novels. 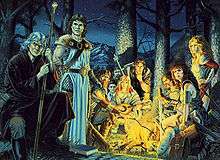 The Hickmans conceived Dragonlance while driving in their car on the way to TSR for a job interview. At TSR Tracy Hickman met Margaret Weis, his future writing partner, and they gathered a group of associates to play the Dungeons & Dragons role-playing game. The adventures during that game inspired a series of gaming modules, a series of novels, licensed products such as board games, and lead miniature figures. In 1984, TSR published the first Dragonlance novel, Dragons of Autumn Twilight. It began the Chronicles trilogy, a core element of the Dragonlance world. While the authoring team of Tracy Hickman and Margaret Weis wrote the setting's central books, numerous other authors contributed novels and short stories to the setting. Over 190 novels have used the Dragonlance setting, and have been accompanied by supplemental Dungeons & Dragons campaign setting material for over a decade. In 1997, Wizards of the Coast LLC purchased TSR, and licensed Dragonlance to Sovereign Press, Inc in 2001 to produce game materials; this licensing agreement expired in 2007. The Dragonlance world is described in dozens of books and novels. The setting contains numerous characters, an extensive timeline, and a detailed geography. Dragonlance is set on the world of Krynn. The majority of the novels take place in the various regions of Ansalon, a small continent, though some have taken place on the continent of Taladas, located northeast of Ansalon. The world's major gods are the High God and his children: good Paladine, neutral Gilean, and evil Takhisis. The gods are opposed by Chaos, who seeks to destroy Krynn. Depending on the time period, the evil chromatic and the good metallic dragons are rare or plentiful. Humans are Krynn's most common humanoid race, but elves, dwarves, kender, gnomes, and minotaurs occupy the world as well. Clerics derive magical powers from their gods, and wizards derive their power from the three moon gods, Solinari, Lunitari, and Nuitari. Hickman had previously served as a Mormon missionary in Java for two years, and uses Indonesian in Dragonlance spells. During Krynn's various wars, armies of draconians are used as troops. Draconians are created by corrupting a dragon egg, thereby creating a reptilian humanoid. The eggs of good dragons create evil draconians, and vice versa. The history of the world of Krynn, and thus the settings for both the novels and gaming supplements, is roughly split into five separate ages. The first age is the time of creation, when the gods are born and Krynn is formed. The Age of Dreams, the second age, is marked by the rapid growth of the world's first great civilizations and the appearance of myriad new races. This era is also marked by three great wars between dragons and their minions. Following the Third Dragon War, in the Age of Might, the Cataclysm obliterates the great empire of Istar and changes almost the entire surface of Krynn. A three-hundred year depression follows this event, in what is called the Age of Despair. This period also marks the War of the Lance. When Dragonlance was first introduced to Dungeons & Dragons, events such as the Lost Wars happened during The Age of Despair. Dragonlances are weapons first created in the Third Dragon War, designed with the purpose of killing evil dragons, and are the only weapons with which mortals can kill dragons. Dragonlances have this power because of the way in which they are created, which requires the use of "two god-blessed artifacts". The weapons clearly draw upon Christian iconography, as the two mythical figures shown defeating dragons, Archangel Michael and Saint George, are often portrayed wielding lances to do so. Dragonlances are rare and not commonly traded. There are lesser dragonlances, which are made when only one of the artifacts is used to create them, and greater dragonlances, which are made when both artifacts are used to make them. Greater dragonlances are blessed with the power of Good, unlike lesser dragonlances. In the beginning, Margaret Weis had problems depicting Tanis Half-Elven in the novels. Tracy Hickman finally told her "He's James T. Kirk of the Starship Enterprise." After that explanation, Margaret had no more difficulty writing about Tanis. Other noteworthy antagonists, and sometimes protagonists, are the Death Knight Lord Soth and Kitiara Uth Matar, the half-sister of Raistlin and Caramon, and leader of one of the Dragonarmies of Ansalon. According to Hickman, Lord Soth is the most unpredictable character to write about, saying "Every time that character made an appearance in one of our books he would try to run off with the story." 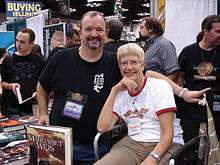 Tracy Hickman and Margaret Weis at Gen Con 2008. In the mid to late 1980s, a rift developed between Weis and Hickman, and TSR. The pair were feeling under-appreciated by the company, and when TSR turned down their Darksword series of novels, they went to Bantam Books. Bantam made them an offer, which they accepted, and they stopped writing Dragonlance novels for TSR. They returned to write Dragons of Summer Flame for TSR in 1995, thinking it would be their final Dragonlance novel. At the time, Dragonlance gaming had been converted to the SAGA System, with limited success, and that, combined with TSR's general financial troubles, put the setting's future in doubt. Wizards of the Coast bought the troubled TSR in 1997, and Weis and Hickman then proposed the War of Souls trilogy, which was published in 2000–2002. All three novels made the New York Times bestseller list, and the setting was commercially revitalized. By 1998, the original Dragonlance trilogy had sold well over three million copies worldwide and spawned dozens of sequels. The central books of the Dragonlance series were written by the authoring team of Weis and Hickman; however, many other writers have made contributions, including Richard A. Knaak, Douglas Niles, Roger E. Moore, Don Perrin, Jean Rabe, Paul B. Thompson, Tonya C. Cook, Michael Williams, Nancy Varian Berberick, and Chris Pierson. In 2001, Wizards of the Coast licensed Sovereign Press to publish further Dragonlance game materials. This began with the newly revised Dragonlance Campaign Setting in 2003, which used the new Dungeons & Dragons 3rd Edition rules. On April 23, 2007, Weis announced Wizards of the Coast had not renewed Sovereign's license, and that Dragonlance RPG game supplements and accessories would only be released through the end of the year. By 2008, there were more than 190 novels in the Dragonlance franchise. Weis and Hickman's Dragonlance novels have made over twenty bestseller lists, with sales in excess of 22 million. The pair's novels have been translated into German, Japanese, Danish, Finnish, Spanish, French, Italian, Hebrew, Portuguese, Greek and Turkish and have sold well in the United States, Britain, and Australia. Not all critics have praised Dragonlance and its creators. According to author Stephen Hunt, Wendy Bradley of Interzone magazine does not think highly of their work. Hunt feels that it is unusual for authors to receive such loathing among "fantasy's literary mafia", saying, "Behind every critic's scorn laden insult, there lays [sic] that unsaid thought at the end: 'But I could have written that!'" Visions of Wonder, edited by David G. Hartwell and Milton T. Wolf, and published by the Science Fiction Research Association, argues that Dragonlance is published under the "omnivore theory" of publishing. In this theory, the readership is made up of teenagers, and completely replaces itself every three to five years. This allows publishers to release subpar novels and still reach a small yet profitable audience. The Second Generation is a single compilation book which picks the most important tales from the Tales series and details the children of the Companions, all of whom become players in the later story. This book is considered to be part of the main storyline, as it must be read to understand the events that happened between the War of the Lance and the Chaos War. This novel develops characters that would later be seen in the War of Souls trilogy. TSR created Dragonlance as a campaign setting for the Advanced Dungeons & Dragons (AD&D) roleplaying game in 1982, publishing the first of a series of modules, Dragons of Despair, in March 1984. They published the first world-spanning sourcebook, Dragonlance Adventures, in 1987. 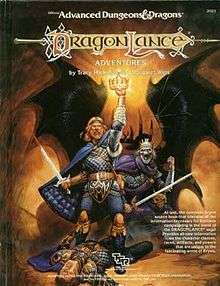 When AD&D was updated to the 2nd edition in 1989, the Dragonlance campaign setting was updated as well. However, in 1996, Dragonlance was converted to use the new SAGA System, which uses cards to determine the effects of actions, with the publication of the Dragonlance: Fifth Age roleplaying game. When the 3rd edition of Dungeons & Dragons was released, Dragonlance was again updated with a new sourcebook (Dragonlance Campaign Setting), although no new adventures were published by Wizards of the Coast. Wizards of the Coast also turned over all responsibility for maintaining the Dragonlance setting in the 3rd edition to Margaret Weis's home company, Sovereign Press. The MUSH game DragonLance is based on Krynn during the final stage of the War of the Lance. The series has inspired mention in music as well, including "Wishmaster", a song by Nightwish based partially on the master and apprentice relationship between Raistlin Majere and Dalamar. The Swedish metal band Lake of Tears also recorded a song called "Raistlin and the Rose" on their 1997 album Crimson Cosmos, while the German group Blind Guardian wrote "The Soulforged", another song inspired by Raistlin's story, which appeared on the band's 2002 album A Night at the Opera. Also Danish/American band Pyramaze recorded in their 2008 album Immortal song "Caramon's Poem". Another German metal band, Evertale, released The Chronicles Chapter I EP in 2008 and the full album Of Dragons And Elves in 2013 - both releases were composed entirely of songs inspired by and relating to Dragonlance. In late 2011, Holysoft Studios Ltd. released the first part of a German audio adaption of the Chronicles Trilogy, with subsequent releases of the later trilogies being announced. 1 2 3 4 5 6 7 8 Hunt, Stephen (January 2002). "Dragon' On". SFCrowsnest.com. Archived from the original on February 11, 2008. Retrieved 2009-02-20. ↑ Hickman, Tracy; Weis, Margaret (1987). Dragonlance Adventures. TSR, Inc.
1 2 3 Wolf 2010, p. 23. ↑ Weis, Margaret; Perrin, Don (August 2003). "Chapter 3, Magic of Krynn, "Dragonlances".". Dragonlance Campaign Setting (1st ed.). Wizards of the Coast. p. 288. ISBN 0-7869-3086-1. ↑ Whiteman, Trampas. "Articles: Tracy Hickman Interview: Lost Chronicles Book Tour and Journeys Beyond!". Dragonlance.com. Retrieved 2009-02-22. ↑ Weis, Margaret (2003) . The Soulforge. The Raistlin Chronicles. Renton, WA, USA: Wizards of the Coast. Forward. ISBN 0-7869-1314-2. 1 2 3 4 5 Archer, Peter (2004). "Dragonlance". 30 Years of Adventure: A Celebration of Dungeons & Dragons. Wizards of the Coast. pp. 64–75. ISBN 0-7869-3498-0. ↑ Weis, Margaret; Hickman, Tracy (November 1999). The Annotated Chronicles (1st ed.). Wizards of the Coast. p. 74. ISBN 0-7869-1870-5. Retrieved 2006-07-01. ↑ Patrick (May 21, 2006). "Interview with Tracy Hickman". SFFWorld.com. Retrieved 2009-02-20. ↑ Hickman, Tracy (April 1987). "TSR Profiles". Dragon. Lake Geneva, Wisconsin: TSR, Inc. (#120): 90. 1 2 Nahrung, Jason (June 27, 2008). "Hickmans write fantasy on a wing and a prayer". The Courier-Mail. Archived from the original on June 30, 2008. Retrieved 2009-02-19. 1 2 "The History of TSR". Wizards of the Coast. Archived from the original on 2008-10-04. Retrieved 2005-08-20. ↑ "Dungeons & Dragons FAQ". Wizards of the Coast. Archived from the original on 2008-10-03. Retrieved 2008-10-03. ↑ Varney, Allen (January 1998). "ProFiles: Margaret Weis". Dragon. Renton, Washington: Wizards of the Coast (#243): 120. ↑ Margaret Weis (April 23, 2007). "Articles: Dragonlance License". Retrieved 2007-06-26. ↑ Saricks, Joyce G. (2001). The Readers' Advisory Guide to Genre Fiction. ALA Editions. p. 49. ISBN 978-0-8389-0803-7. ↑ Slavicsek, Bill; Baker, Rich; Grubb, Jeff (2006). Dungeons & Dragons For Dummies. Wiley Publishing. p. 373. ISBN 978-0-7645-8459-6. Retrieved 2009-02-12. 1 2 Oxoby, Marc (2003). The 1990s. Greenwood Publishing Group. p. 148. ISBN 978-0-313-31615-9. ↑ Maas, John-Michael (April 19, 2004). "Rival Fantasy Publishers Rally Around Star Author". Publishers Weekly. Retrieved 2009-02-19. 1 2 Hall, Melissa Mia (June 7, 2004). "Dragon Lady Keeps Flying". Publishers Weekly. Retrieved 2009-02-19. ↑ Hartwell, David G.; Milton T. Wolf (1996). Visions of Wonder. MacMillan. ISBN 978-0-312-85287-0. ↑ Margaret Weis and Tracy Hickman. "Dragons of the Dwarven Depths". Wizards of the Coast. Retrieved 2006-07-18. ↑ Winkelspecht, Dean (January 13, 2008). "DragonLance: Dragons of Autumn Twilight (DVD)". DVDTown.com. Retrieved 2009-03-15. ↑ Maloni, Kelly; Baker, Derek; Wice, Nathaniel (1994). Net Games. Random House / Michael Wolff & Company, Inc. p. 107. ISBN 0-679-75592-6. ↑ "Dragonlance Inspired Music and Musicians". Dragonlance-Movie.com. Retrieved 2009-03-14.